The need for temporary surface protection films and covers has grown extensively in the construction and abatement fields. Here you can find flooring protection food hardwood floors, tile, carpet, marble and granite. 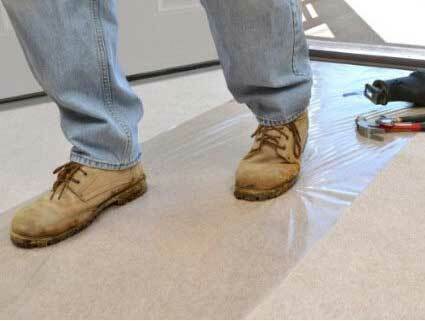 Protecting your floors reduces clean up and damage claims while building, remodeling or painting. 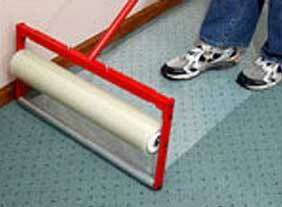 Clear, self-adhering protective film for all types of carpeting. The non-slip surface is a special blend of polyethylene, which is highly resistant to tears or punctures. Protect clients’ carpeting and reduces clean up and damage claims while building, remodeling or painting. Ideal protection during inclement weather. Designed for areas where flame retardant materials are required by code. High tack, residue free application. No special preparation required and can be used immediately. Replaces traditional materials such as drop cloths, tarps and visqueen. Conforms to bends and curved surfaces. Protects carpets for up to 30 days. Ideal for wool and synthetic carpeting. Excellent for high rise commercial applications. Self-adhering protective film for hard surfaces, such as tile, marble, granite, vinyl, VCT-, laminates and factory finished hardwood. It can be used to prevent damage to tubs and counter tops. Protect clients’ flooring and reduces clean up and damage claims during building, remodeling and painting. 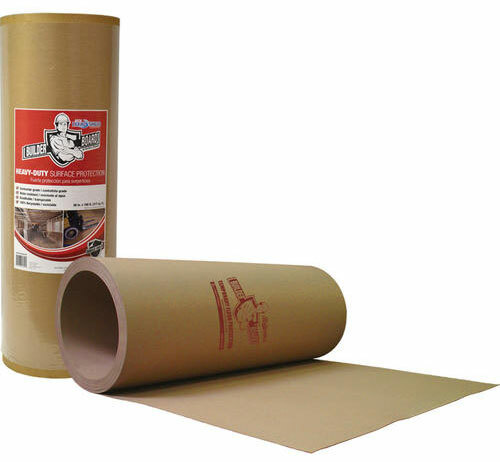 Non-staining, water resistant protection that is made from a lamination of two strong kraft papers with nylon scrim reinforcement. 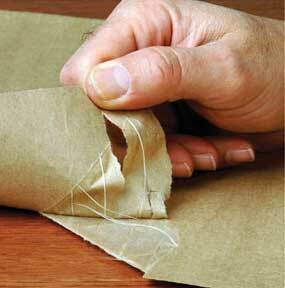 Does not tear under normal traffic wear, which eliminates constantly replacing torn paper. Protect flooring such as hardwood, laminate, and tile. Granite, Travertine, Marble, Terrazzo, Stone, Colored Concrete, Tile, Wood, Carpet, Linoleum, etc. 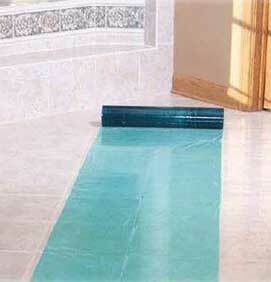 Allows you to apply various sizes of floor protection quickly and easily. 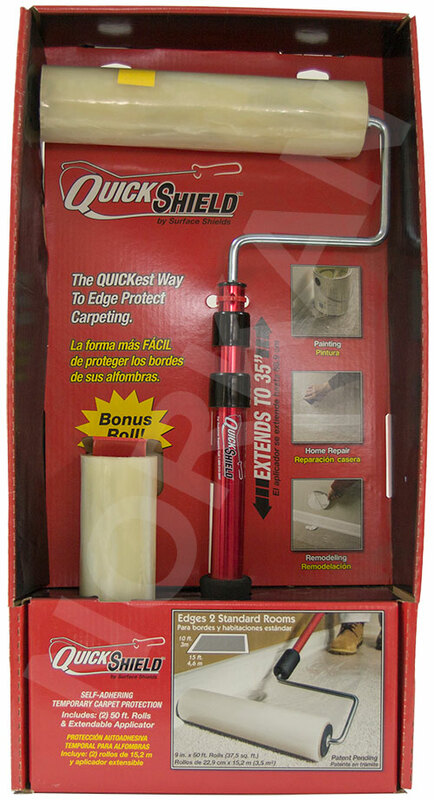 Durable,spring-action roll holder is a time saver whether you are covering large or small areas. 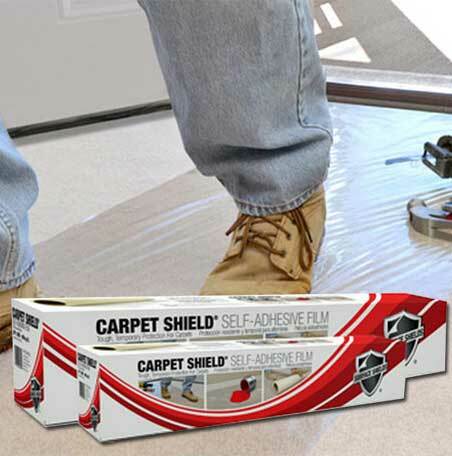 Applying CARPET SHIELD®, FLOOR SHIELD™ or another flooring protector. • 3 in 1 Multi-use applicator - 24", 30" & 36"
• 4 in 1 Multi-use applicator - 36", 42", 48" & 60"